Activity sharing website Strava allows users to track and upload their rides (and runs) using GPS data, either from Strava’s dedicated app on a smartphone or via a third-party GPS bike computer, such as those from Garmin. Strava’s service allows millions of cyclists to connect with each other, with the facility to comment on each others’ rides and give ‘kudos’ where they think the effort deserves it. One of the most attractive aspects to the more competitive rider of Strava’s service is the use of ‘segments’. These user-generated sections of a route are used to create a leaderboard of the fastest riders, with a King of the Mountain (KOM) or Queen of the Mountain (QOM) crown symbol awarded to those with the fastest times. Chasing KOMs/QOMs can become addictive. 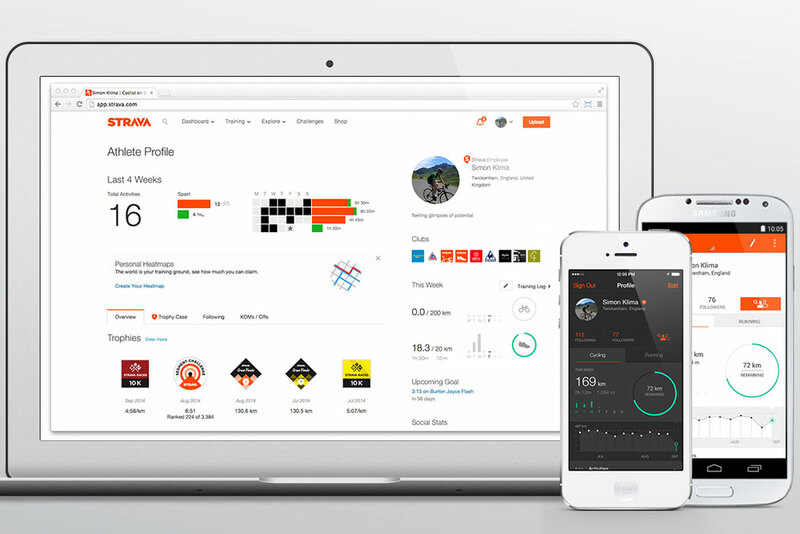 How do you get started using Strava? Currently, Strava can be used to log a wide range of ride data including GPS tracked route displayed on a map, speed, distance, power output and heart rate. The various aspects of Strava allow it to be used as a form of social media (including the uploading of photos taken during a ride), as a serious training tool and as a way of comparing your riding to others from all around the world. Strava users can sign up for a variety of motivational challenges, such as those which set a distance or climbing target to meet. Progress is tracked after each ride is logged, and a ‘badge’ awarded when the challenge is complete. In many ways, Strava has revolutionised the way in which cyclists can communicate and compare their efforts. In August 2018, Strava introduced its three stage ‘Summit’ pricing structure. This replaced the ‘Premium’ service on offer up until that point. Whilst you can use Strava for free, the Summit packages provide you with access to extra features. There’s three ‘Summit’ packages: Training, Analysis and Safety. You can purchase one for £2.49 a month/£18.99 a year, or all three for £6.99 a month/£47.99 a year. Those who already had a Premium account can keep using it, for £44.99 a year or £5.99 a month. The ‘Training’ pack includes training plans, custom goals, race analysis and breakdowns of segment attempts. The ‘Analysis’ pack provides a visual display of time spent in each zone, lap data, ‘Fitness and Freshness’ info (like Fitness/Form – explained here), live segment info and ‘relative effort’ feedback. The ‘Safety’ pack provides real time tracking for friends and family in the shape of ‘Beacon’, plus personal heatmaps. The Strava heatmap recruits the efforts of all its users, showing over 1 billion activities on a map of the globe. Not only does this look incredible, it can also be used by town planners and councils to establish which roads cyclists are likely to use, which areas they’re avoiding, and more. Premium users can now create a personal Strava heat map – this will show everywhere they’ve ridden, run or otherwise logged an activity across the globe. You can create and share a route on Strava. To do this, go to ‘Dashboard’ > ‘My Routes’ – here you can set start, end and way points. The ride can be downloaded to your phone or cycling computer. Premium members can also download routes ridden by friends. Simply hover over the ‘GPX’ button displayed on the map of their ride, and click ‘download’. Using Strava with a GPS cycling computer is very simple. Create a Strava account, record your ride in the normal way, then log in to Strava and click the ‘upload’ button in the right hand of the screen to send the file. To speed the process up, if you’re using a cycling computer with Bluetooth you can usually send the file directly. When using a Garmin Edge GPS, you do this by downloading the Garmin Connect app, creating an account, then linking the account to Strava (Settings > 3rd Party Apps > Strava). Once you’ve done this, link the phone to the computer via Bluetooth and all rides will appear automatically on both apps. Using a phone with a sturdy mount and case, as opposed to a cycling computer, has become popular in the last few years. To use Strava on your phone, just download the app, and click ‘start’ when you’re ready to begin your ride. You can set the app up to autopause as you would on a computer. For those who have moved on to new gadgets, Strava also works with units like the Apple watch. This means you can leave your phone at home, begin and end rides, and see live updates – all from your wrist. Premium members are able to receive live updates when segments are approaching, and information about their performance as they ride. To do this, you need to ‘star’ the segments you want to watch, and Strava will add in a handful of particularly popular local stretches. Strava Live segments works with a large number of devices – including Garmin, Wahoo, Polar and Lezyne computers. A Garmin device will be automatically set to display Garmin Segments. To change this, open Garmin Connect, add ‘Segments’ to your Dashboard, then change the settings to report Strava Segments. Relive is a third party app that’s popular with Strava users. Simply complete a ride on Strava (Garmin Connect, Endomondo or Polar), and Relive will play it back in a personalised video. Strava Suffer Scores are only available to Strava Premium users. It’s much like ‘Training Stress Score’, which is the term and algorithm used by most power meter software tools. Essentially it looks at how long you spent in different training zones – the longer you spend in the upper zones, the higher the score. A particularly high Suffer Score might tell the rider it’s a good idea to back off for a few days and recover, whilst completing a workout you’ve done before at the same speed and getting a lower Suffer Score may indicate a bump in fitness. Strava Flyby allows you to see the rides of others who you may have passed on your travels. You can see the ‘correlation’, ‘spatial correlation’ (how much time you spent in close proximity) and ‘distance’ – the overall distance of their ride. You can also see speed and elevation comparisons. For obvious reasons, not everyone wants to be on Strava Flyby. To opt out, go to ‘Privacy Settings’, and select ‘Nobody’ when asked who should see you in this frame. Another Premium only option, Strava Beacon allows the user to select up to three contacts, who will be able to see where they are on a map. Beacon works in iPhone, Android, and compatible (Bluetooth enabled) Garmin Edge units. To enable the feature on a phone, simply turn the Beacon on before a ride. When using a Garmin, it’s ‘LiveTrack’ that you need to switch on. The reputation of Paris-Roubaix is among the most fearsome of all cycling races. It’s almost impossible to imagine the workload required to finish first in the toughest sporting event in the world, the Tour de France. Chris Froome never fails to impress on Strava, but his latest offering is even more striking thanks to the terrain and bike choice. We round up the hardest Strava segments that the world's tarmacked roads have to offer, including 100km Peruvian ascents, and 100m, 34% American streets. Struggling to get your name at the top of that elusive KOM or QOM on your favourite online ride-logging service? A small Welsh town could claim the title for steepest street in the world, taking the record from Baldwin Street in New Zealand. Alberto Contador took the chance to test himself against the current pros on the Col de Portet, setting a time on Strava that only three were able to beat. Strava gives a great insight into the effort needed to compete in the Tour de France, and we've rounded up a few of the riders who you should follow. You joined Strava for a bit of fun, but since then it's all got a lot more serious, and there are a few things you wish you'd known before you singed up. If Niki Terpstra's victory in E3 Harelbeke didn't look impressive enough on TV, then the Dutch rider's upload to Strava really shows his incredible effort. Strava has made changes to its global heatmap after it was revealed that it had inadvertently highlighted the location of several secret military bases. Are you a Strava addict? Chris Froome knocked out his biggest training ride of the year at the weekend, racking up nearly 300km at an average speed of almost 45kmh. If you want to know what sort of base miles it takes to win four Tours de France, then Chris Froome is back on Strava and uploading some huge rides.